The Q3DScatter class provides methods for rendering 3D scatter graphs. 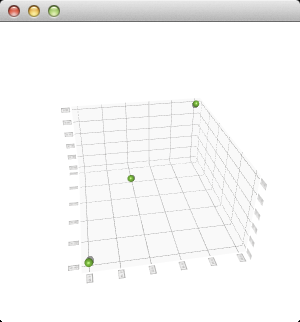 This class enables developers to render scatter graphs in 3D and to view them by rotating the scene freely. Rotation is done by holding down the right mouse button and moving the mouse. Zooming is done by mouse wheel. Selection, if enabled, is done by left mouse button. The scene can be reset to default camera view by clicking mouse wheel. In touch devices rotation is done by tap-and-move, selection by tap-and-hold and zoom by pinch. If no axes are set explicitly to Q3DScatter, temporary default axes with no labels are created. These default axes can be modified via axis accessors, but as soon any axis is set explicitly for the orientation, the default axis for that orientation is destroyed. Q3DScatter supports more than one series visible at the same time. The scene can be rotated, zoomed into, and an item can be selected to view its position, but no other interaction is included in this minimal code example. You can learn more by familiarizing yourself with the examples provided, like the Scatter Example. See also Q3DBars, Q3DSurface, and Qt Data Visualization C++ Classes. This property holds the active x-axis. This property holds the active y-axis. This property holds the active z-axis. This property holds the selected series or null. Constructs a new 3D scatter graph with optional parent window and surface format. Destroys the 3D scatter graph. See also releaseAxis(), setAxisX(), setAxisY(), and setAxisZ(). Note: Getter function for property axisZ. See also addAxis(), setAxisX(), setAxisY(), and setAxisZ(). Sets axis as the active x-axis. Implicitly calls addAxis() to transfer the ownership of the axis to this graph. Note: Setter function for property axisX. See also axisX(), addAxis(), and releaseAxis(). Sets axis as the active y-axis. Implicitly calls addAxis() to transfer the ownership of the axis to this graph. Note: Setter function for property axisY. See also axisY(), addAxis(), and releaseAxis(). Sets axis as the active z-axis. Implicitly calls addAxis() to transfer the ownership of the axis to this graph. Note: Setter function for property axisZ. See also axisZ(), addAxis(), and releaseAxis().